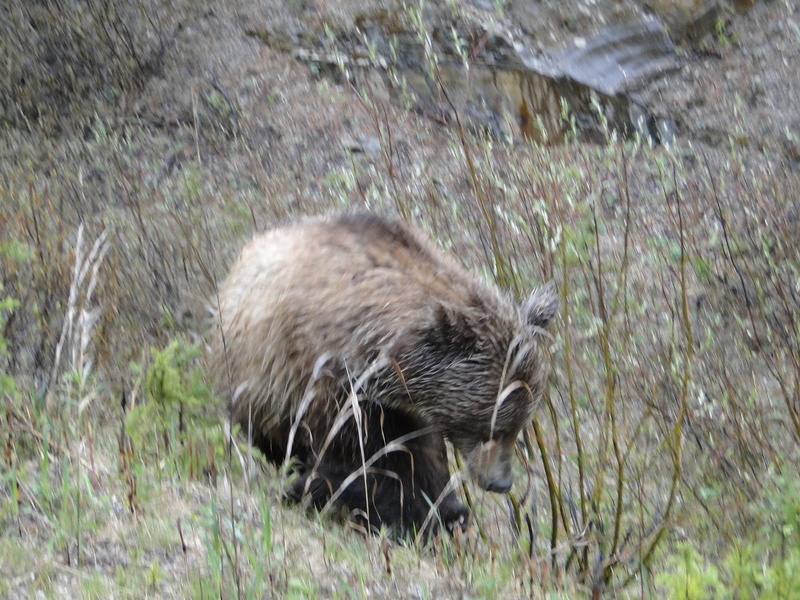 We started the day with a drizzly rain but it ok because we drove slowly looking for wildlife. 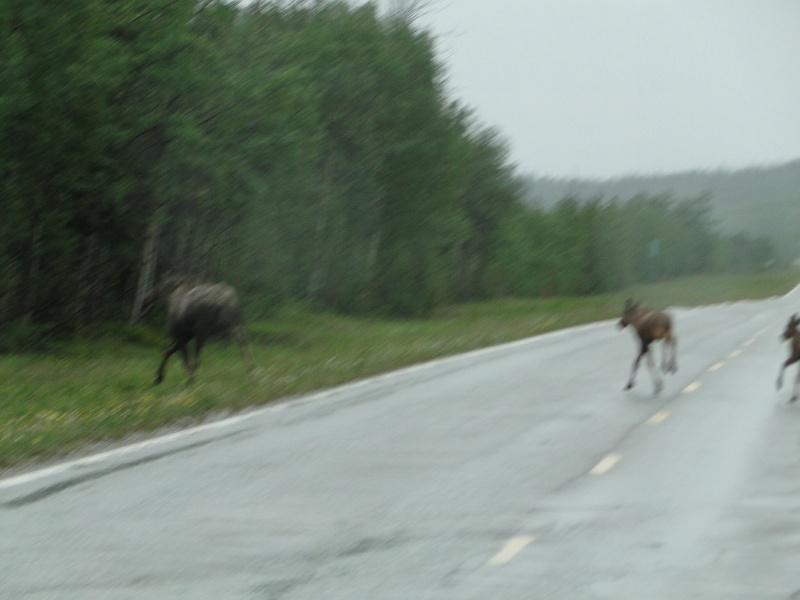 It wasn’t long before Greg spotted a mama moose and two babies crossing the road ahead of us. 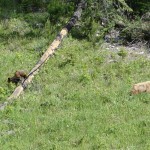 It seemed that mama told the babies to make a run for it so they did. They all skittered across the road as quickly as possible. 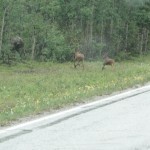 So far this trip we have seen 7 mama moose and 5 babies. 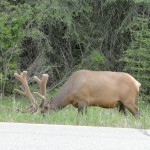 we arrived in Glenallen around noon and we stopped at the caribou hotel and Restaurant for lunch. It’s always a good sign when locals frequent the place, and arriving at noon, we found the place to be full of locals. We saw a tray of hamburgers being delivered to a table and they looked so good we ordered them for ourselves. Hands down, they were the best burgers we’ve had in a long time!!! So we really enjoyed our hot lunch. 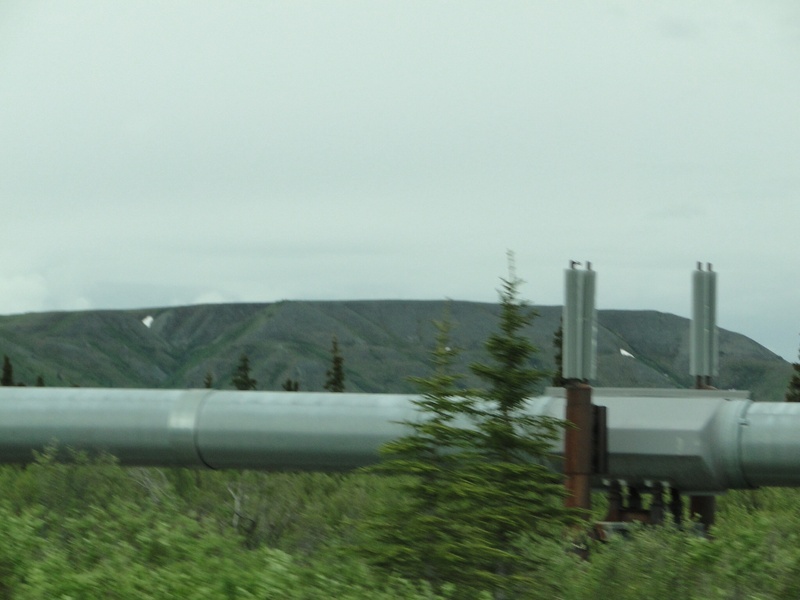 because we are on the highway that heads down to Valdez, we’ve followed the Alaska pipeline all day. It’s such an engineering feat and Greg really enjoyed seeing it up close. 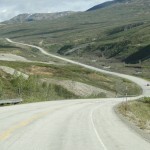 We did not drive this part of the road on our last trip, so we have really enjoyed the scenery. 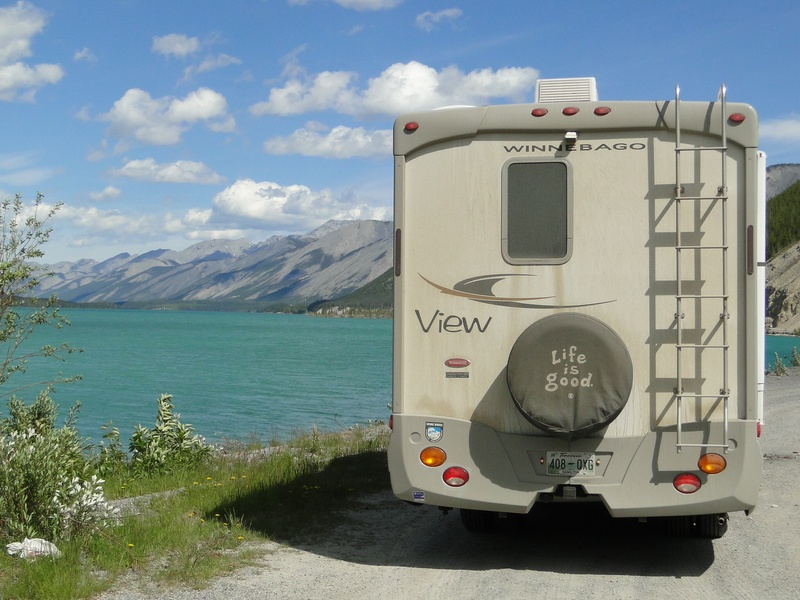 it occurred to me today that I better make some reservations for the upcoming week due to the July 4th holiday so as soon as we settled in our campground in Grand View, Alaska, I started plotting the next couple of weeks. Everything worked out except for a couple of days we will have to camp without services but we can prepare for it. 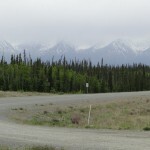 Tomorrow we will drive toward Cooper Landing on the Kenai Peninsula. We awoke to a sweet drizzle so we took our time getting up and around. Since we only had 100 miles to drive today, we had a nice breakfast of bacon and eggs, juice and coffee. It was delicious!! The rain stopped shortly and we started out. 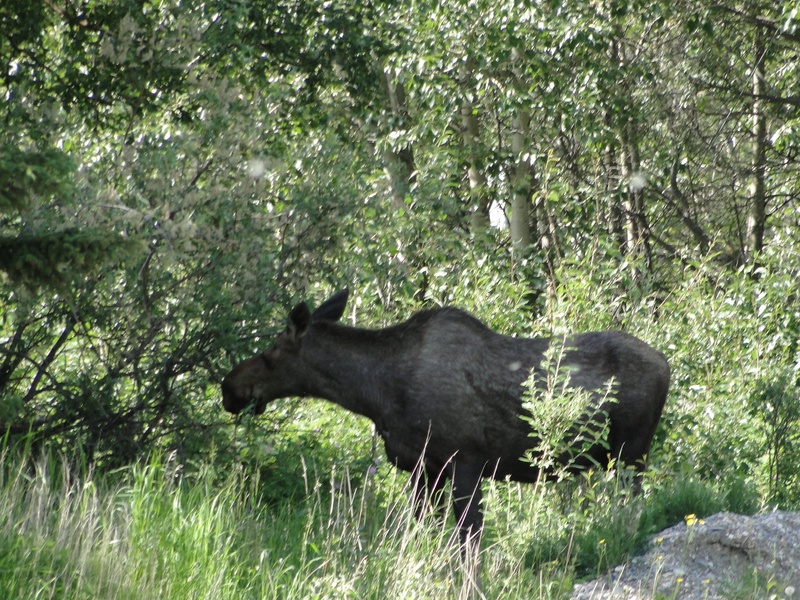 we saw four moose on the drive as well as three babies but they are very skittish near the highway so as soon as we saw them they skedaddled into the tree line. I was so hoping to get a photo but just couldn’t get one. 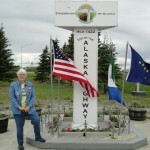 We stopped at the Visitor Center in Delta Junction to take a photo at the end of the Alaska Highway marker. 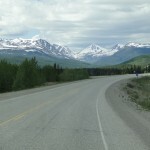 So we have now driven the entire Alaska Highway TWICE!! 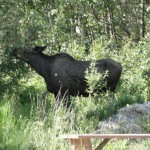 We checked into our RV park for the evening, and as we were reading in our RV, Greg looked up and saw a MOOSE at the edge of the trees near our RV. 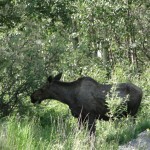 We stepped out of the RV and stood quietly while we watched the moose graze at the edge of the campground. 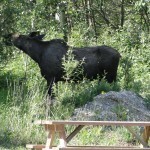 So finally some photos of a MOOSE! Did it get in the bucket? 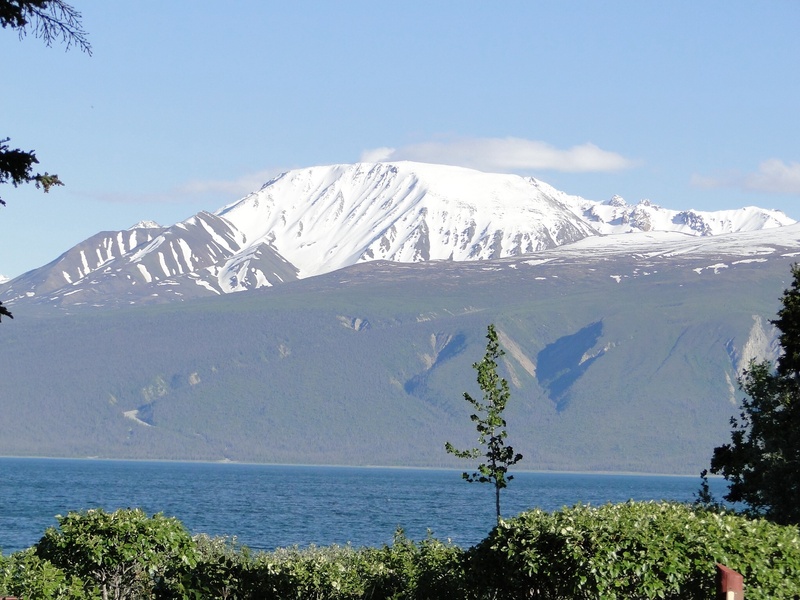 We spent last night on beautiful Lake Kluane near Destruction Bay, Yukon. I saw this campground on our last trip here and thought we would enjoy it and we sure did. 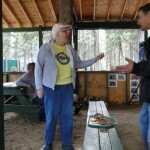 The owners of the campground told us to take the spot on the lake using two sites since they were not busy. 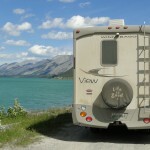 So we parked the RV parallel with the lake and had the entire setting right out our window. I have to tell you we hardly slept a wink however. Yesterday was the summer solstice, the longest day of sunshine of the year. Honestly the sun was blasting down for 23 hours. This is not an exaggeration!!! From around 1 am to 4 am, the sky was like dusk, and then sunup again. So we were very restless. Tonight will be better. 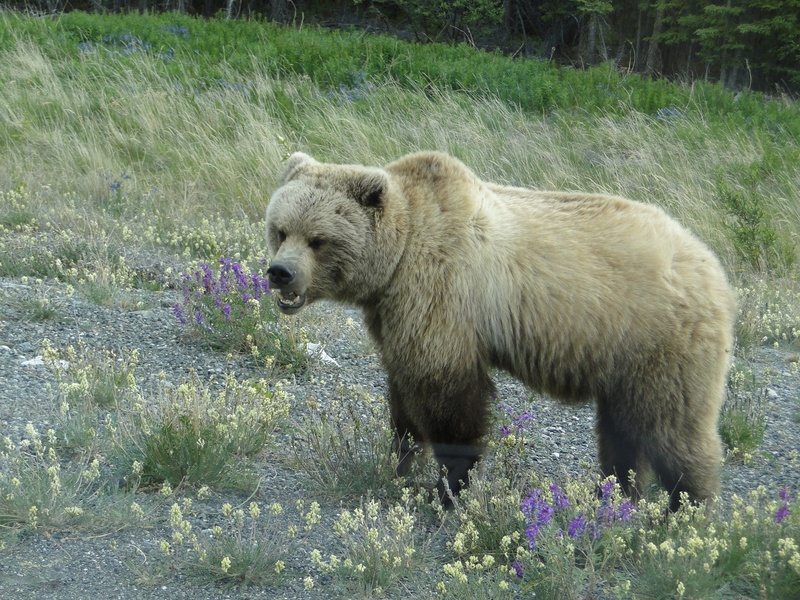 We were only a few miles from the campground this morning when we came upon a beautiful grizzly bear right beside the road, grazing on the fireweed that is so prevalent here. 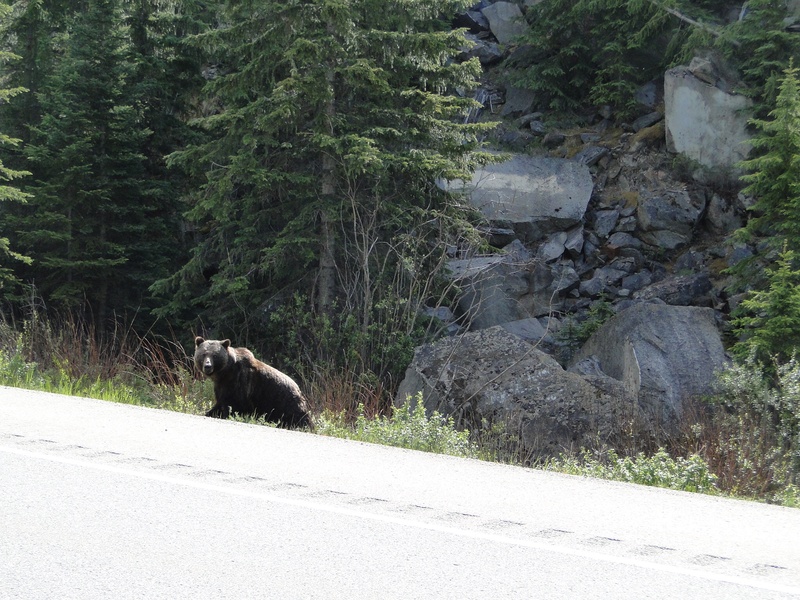 We were able to stop right in the middle of the road, not one vehicle coming in either direction, and we watched the grizzly for at least 15 minutes. He was within 6 feet of the RV, and he never flinched. 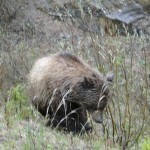 Then two more occasions we saw grizzlies on our morning drive. 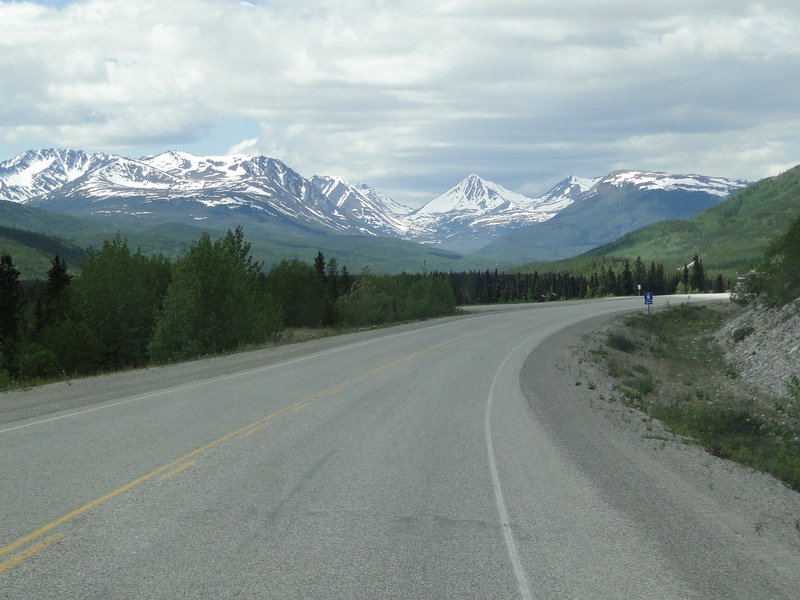 The Alaska Highway was practically deserted so we could stop any time we wanted. 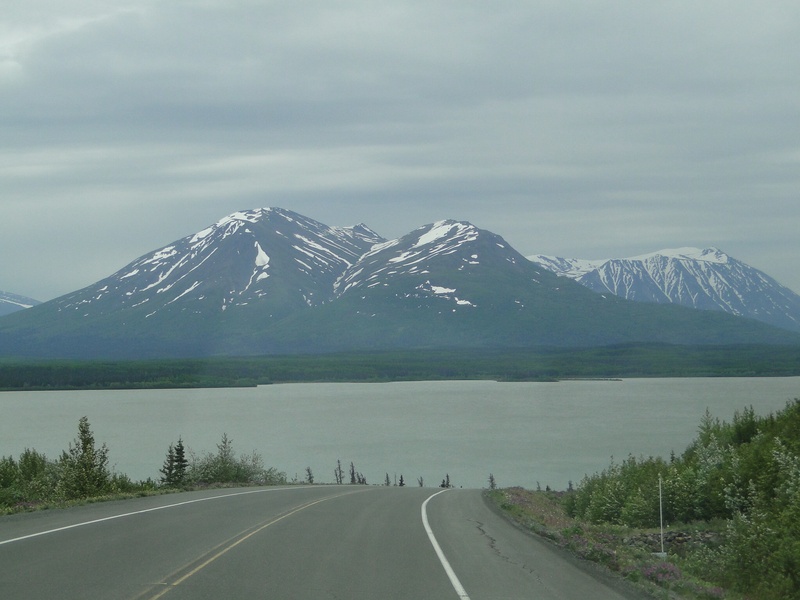 The roads between Destruction Bay and Beaver Creek, going toward the Alaska border, were the worst we’ve had on the trip. We were expecting this however, so we were prepared to drive this 100 mile distance around 25 miles per hour. Lots of frost heaves, gravel, etc. At least it wasn’t raining. 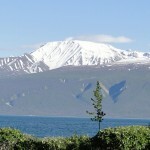 We arrived in Tok, Alaska with another time change. I think we are about 4 hours behind eastern time. After we checked into the Sourdough Campground, we stopped by a nice gift shop and bought a couple of jackets for ourselves. Bought a couple of things for the grandchildren. Then off to the grocery store. Then an afternoon of doing laundry. We met an interesting couple while doing laundry. 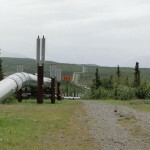 They work for the Milepost, the travel guide for Alaska. 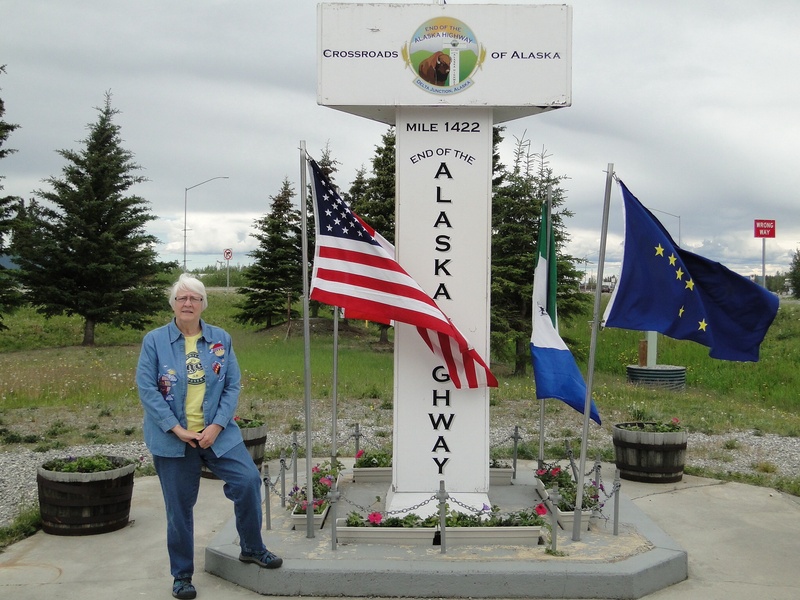 They travel around Alaska each summer and update entries for the Milepost. 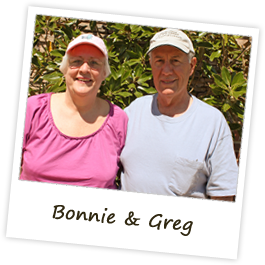 She gave us such good information about some boat trips and train excursions. 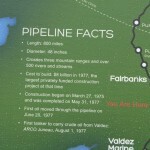 They knew absolutely everything about Alaska!!! 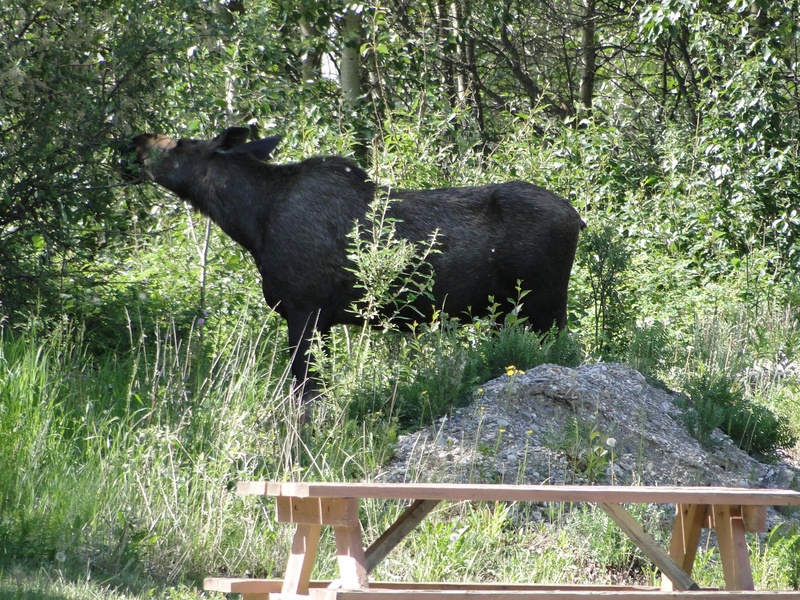 This campground has quite the social calendar. Every evening they have a “pancake toss”. The campground has a cafe and they are famous for their sourdough pancakes. 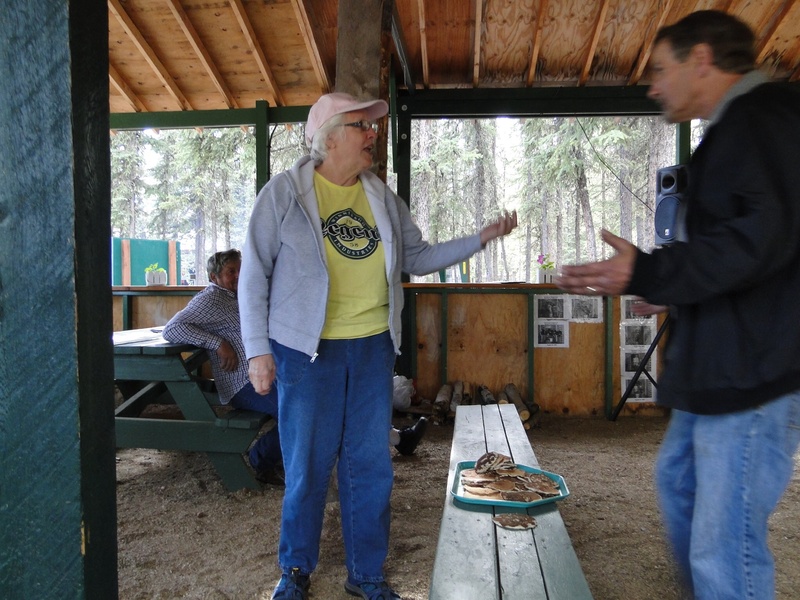 Campers get two chances to toss a pancake into a bucket. If you get a pancake into the bucket, you get a free breakfast of pancakes and sausage. One gentleman actually got a pancake into the bucket. Greg and I both tried, and came very close, but didn’t get it in the bucket, but it was hilarious trying. 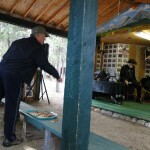 They also had a husband and wife team who sang country music and were very good. Everyone brought their chairs and we enjoyed an evening getting to know the fellow travelers. One couple danced and we had a great evening. 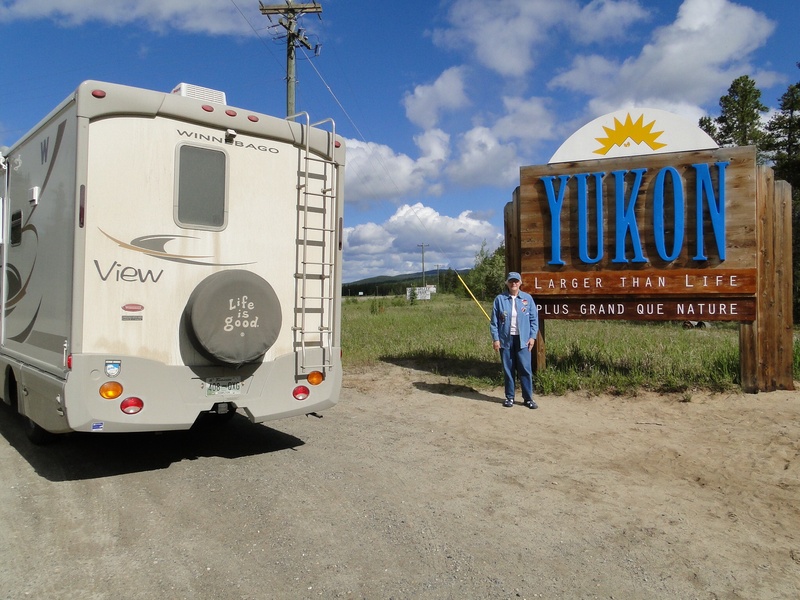 We enjoyed our stay at the Pioneer RV Park in Whitehorse. 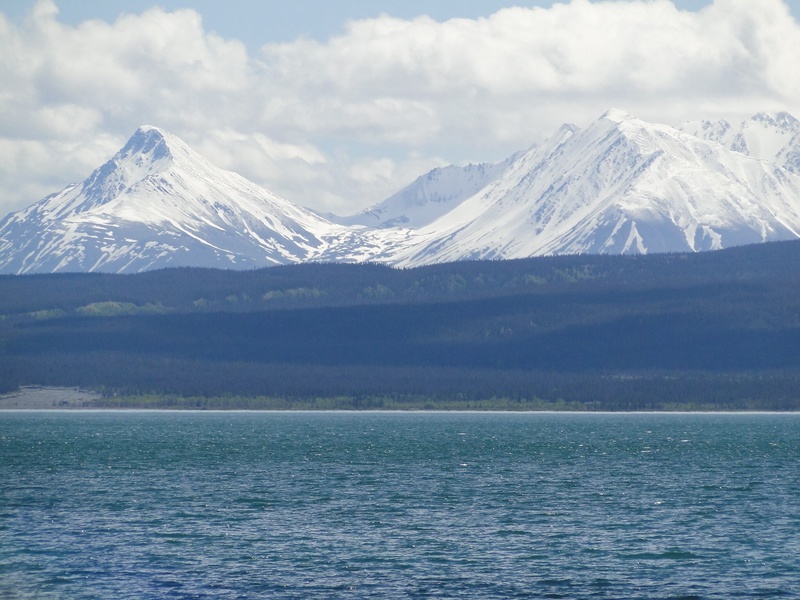 This morning we headed out for Haines. 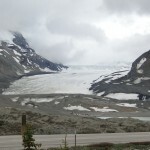 I believe this was the most spectacular scenery we have had on this trip. The weather was cold, rainy, and windy, but the scenery was so beautiful. 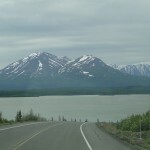 Snow covered mountains were on every side of us as we drove to Haines. And the roads were excellent. 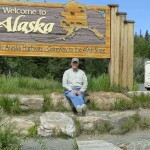 About 20 miles from Haines we had to do a border crossing from Yukon to USA and it only took a moment. Then we had to use US dollars for purchases. Didn’t really buy anything except some smoked salmon. 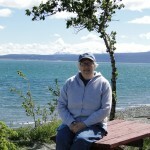 We are at the Hitch-up RV park in Haines and it is very nice. 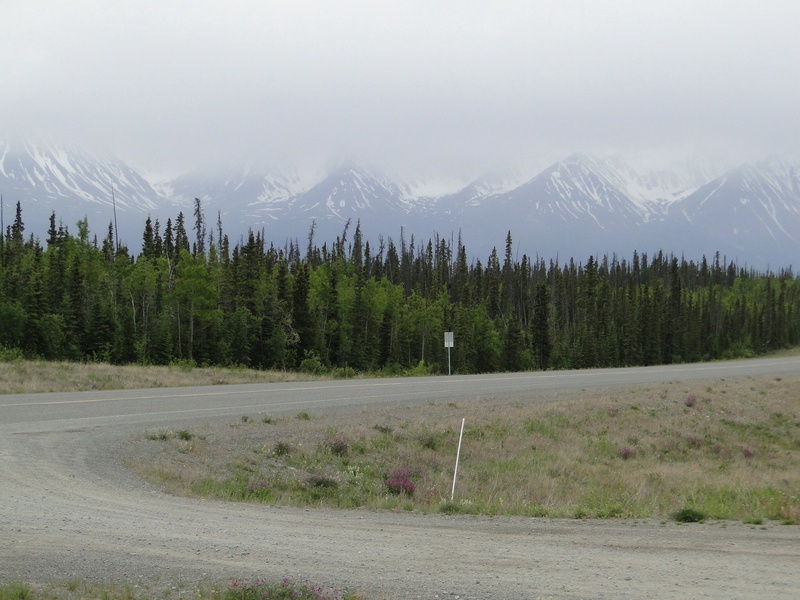 The only road to Haines is one road in, same road out, so we will backtrack about 150 miles to haines Junction, and then onward toward Alaska again. We should be able to spend tomorrow night at Resurrection Bay in a campground I saw on our last trip and thought it was so pretty I wanted to spend a night here. 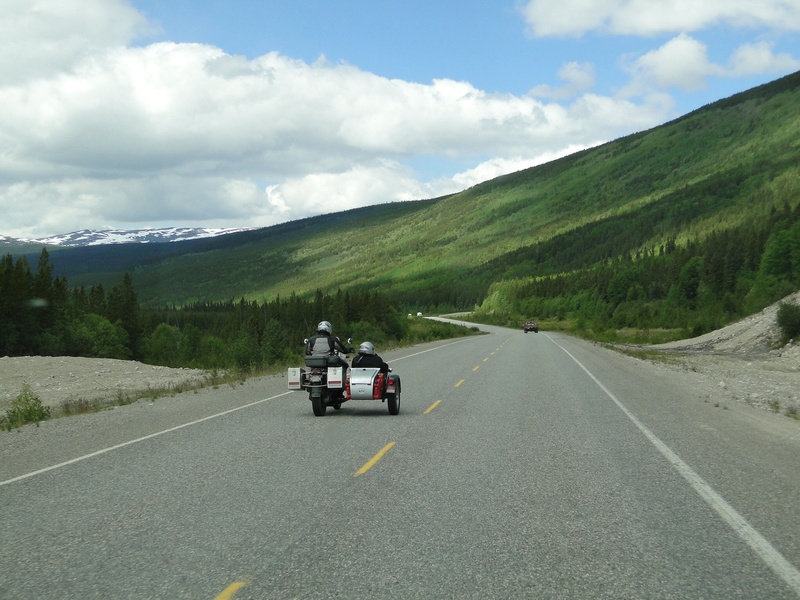 We have had a couple of interesting days, very much in the wilderness and beautiful scenery at every turn. 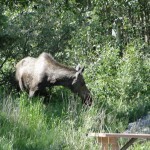 We started the Alaska Highway and spent a night in the Liard Hot Springs Provential Park. 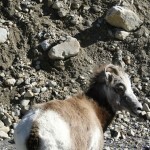 We spent time in the hot springs, and we both agree they were HOT this year, hotter than our last visit. Actually there are two sections of the springs, and we had to move down stream from the hottest area. 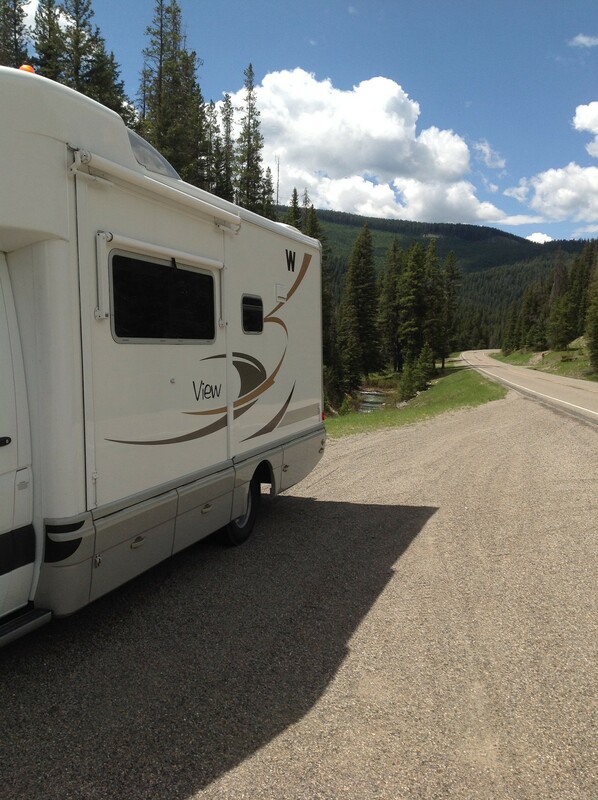 The camp has no services, so you are forced to spend quiet time reading and communing with nature. We bought some firewood and had a nice fire after dinner. It seemed an appropriate evening to have country ham, grits, and eggs for dinner, so that’s exactly what we had. 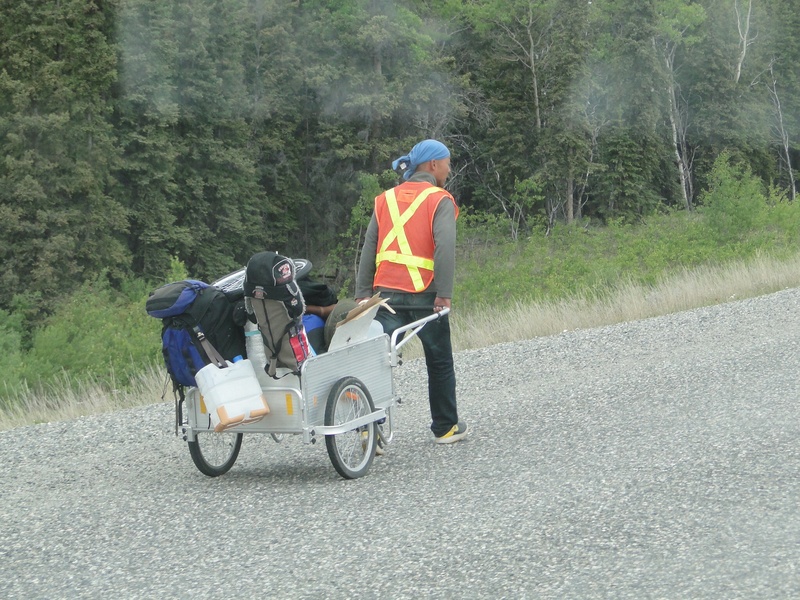 Today we arrived in Whitehorse. We did some grocery shopping, and finally have decent WIFI so I can catch up on email and the blog. 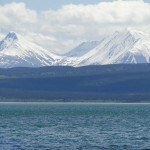 We are skipping Skagway by road this trip, and will drive to Haines, Alaska, which we visited by boat last trip. 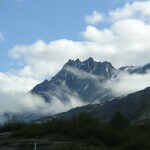 This trip we may visit Skagway by boat, and spend the weekend in Haines. Well now that sentence sounds confusing. 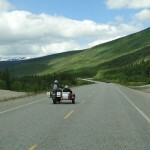 You can only get to Haines and Skagway by road, but you cannot get from Haines to Skagway by road. Both roads are one way in, one way out. 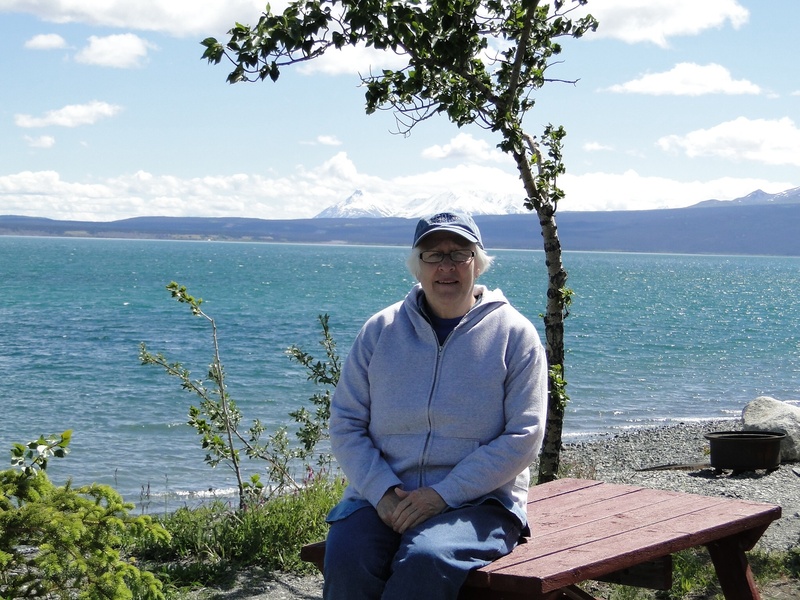 So last trip to Alaska, we drove to Skagway, and took a boat to Haines. 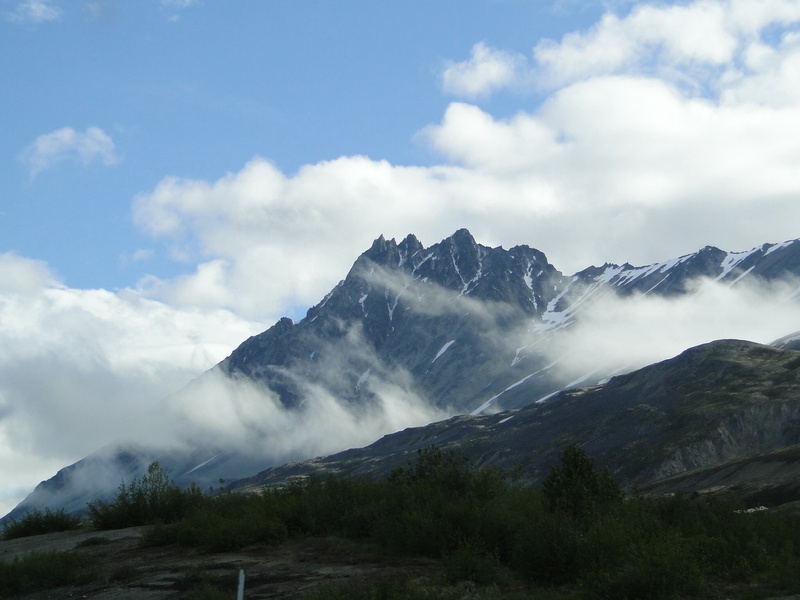 This time, we are driving to Haines, and then we can decide if we want to do Skagway by boat. 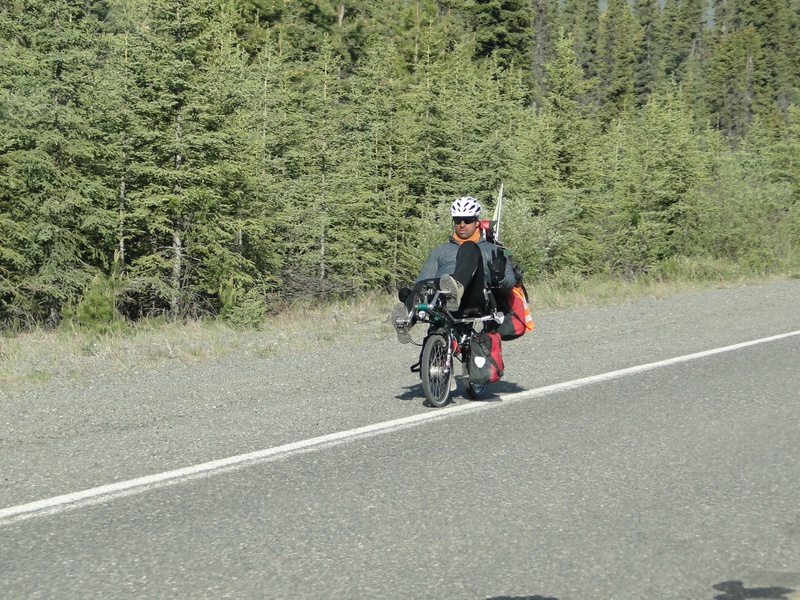 We left Dawson Creek this morning after a good breakfast. 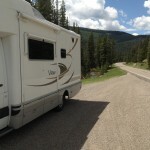 It rained off and on during the day, and the mud and rain on the roadway made a mess of the RV. You should see the back end. Then to add insult to injury, we paid $7.08/gallon for diesel fuel! We’ve had difficulty getting decent wifi, so I can’t put photos out today. 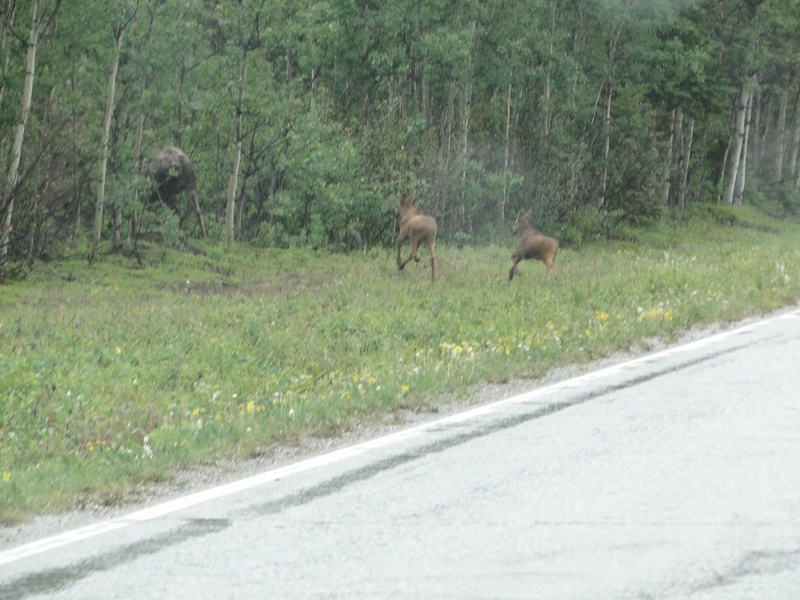 We saw two foxes, four black bears, and strangely, TWO dead moose on the side of the road, at different times. 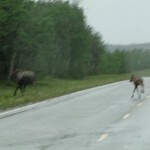 They both must have been hit on the road, and lived long enough to get to the side of the road. We hated to see something so big and majestic killed in this way. 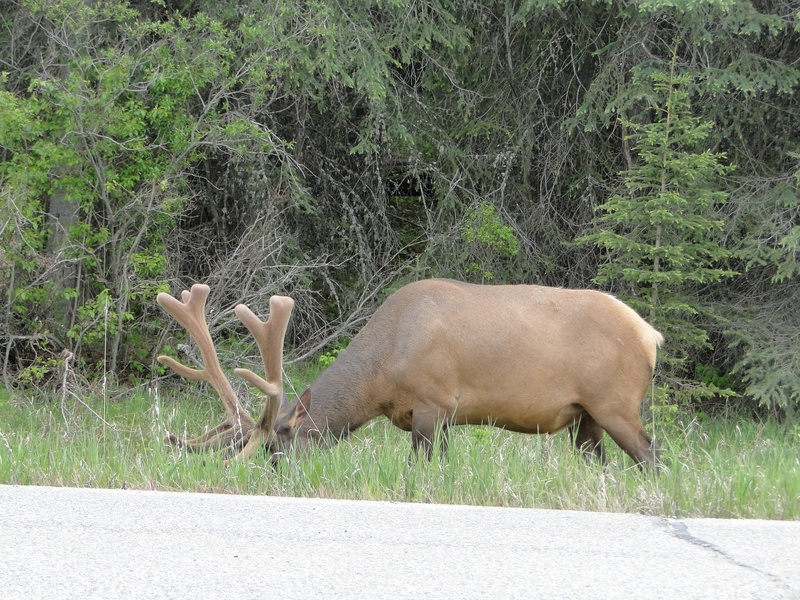 But the dangers of the road are great when mixed with wildlife. You guys who live in the country know what I mean. 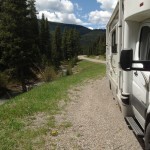 tomorrow we will get to Laird Hot Springs Provential Park. The campground is beautiful with it’s of trees and quiet. No services, but there is a wooden walkway over to the hot springs. We will enjoy the springs, and enjoy the quiet time reading and walking. We had a nice drive today. 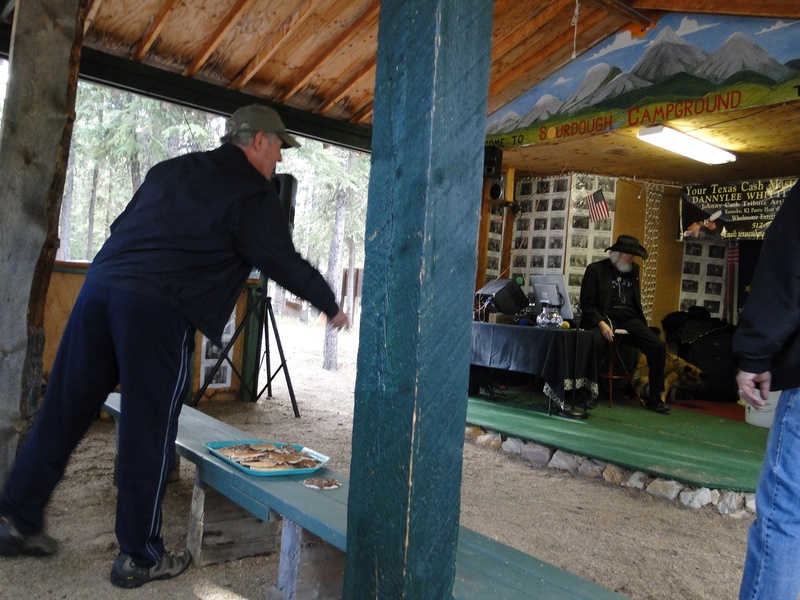 The little town of Chetwynd was celebrating their annual international chain saw carving festival. We stopped for lunch and then walked around the grounds to watch the carvers do their work. It’s really very interesting to see their elaborate carvings. 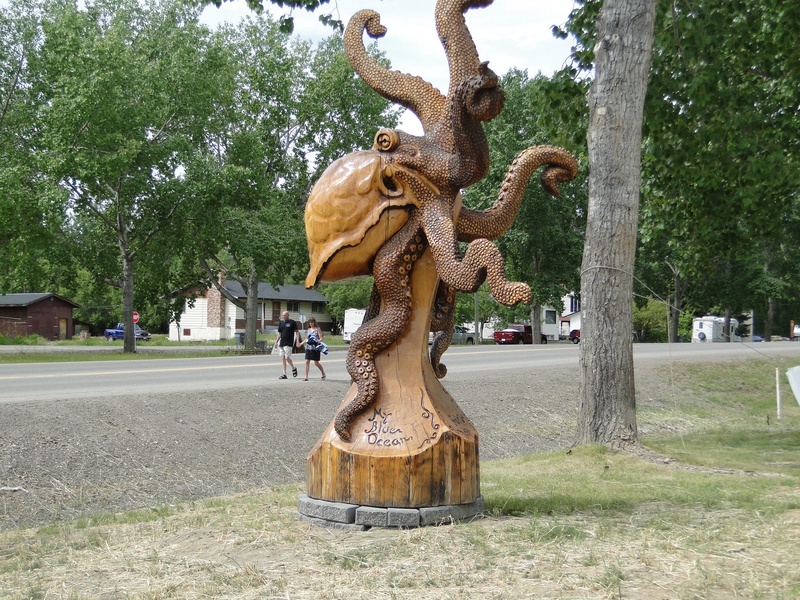 The winner is selected by committee, and the carvings are donated to the city of Chetwynd. 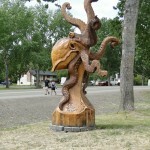 They display the carvings up and down the highway through town. 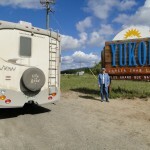 We arrived in Dawson Creek and took photos by the famous sign designating the Mile 0 of the Alaska Highway. We will be in and out of service this week but will post when possible. We are having a difficult time finding good wifi. Every campground advertises it, but it hardly works anywhere. I’m going to take the pressure off myself by saying I will post when I can. 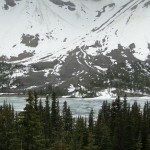 We had a great week in Banff National Park. 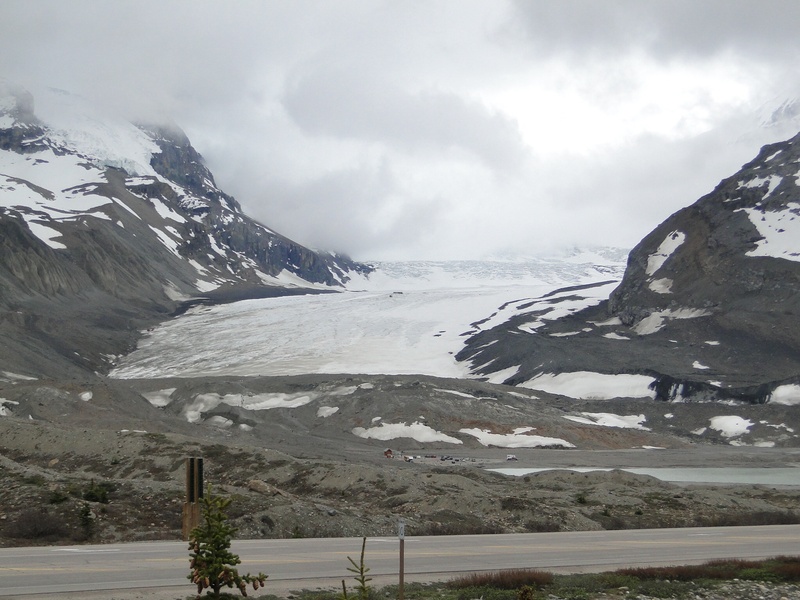 Weather is cool, and the scenery is spectacular. I’ve got some great photos if ever I can download them. 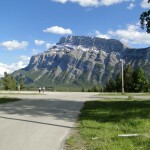 We left Banff yesterday morning and spent last night in whistlers Campground near Jasper. 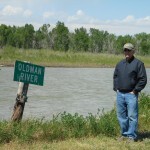 Don and Sandie, you remember we could not get into it in 2010, so we stayed across the highway in the overflow? 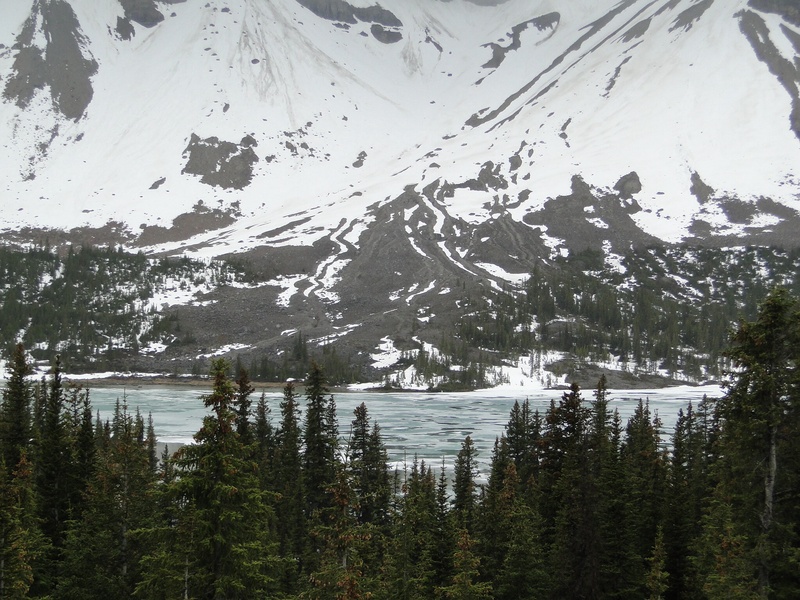 Well this time we stayed in Whistler but it didn’t hold a candle to Tunnel Mountain in Banff. Actually I think the overflow was better! 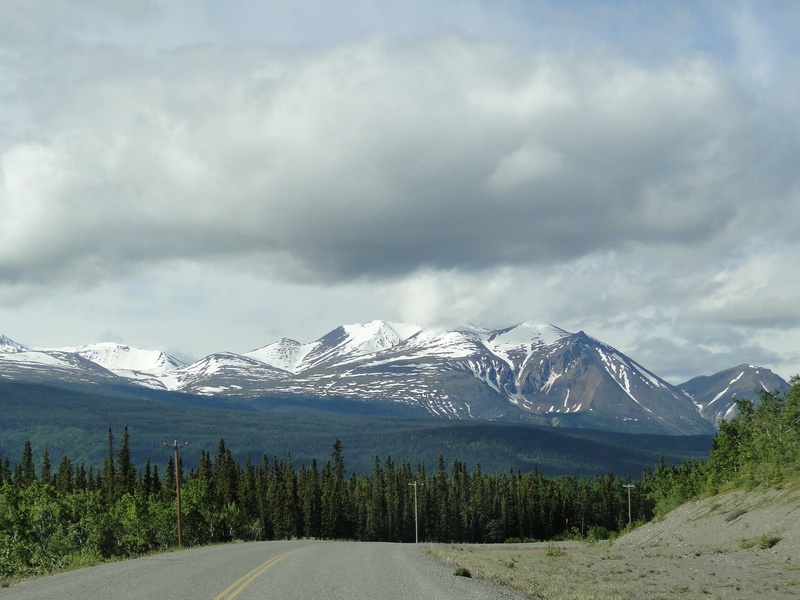 Today we drove to Prince George in British Columbia. 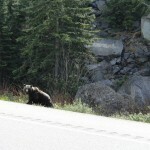 We could not believe how many bears we saw on the sides of the road. 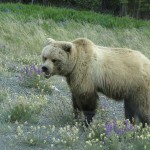 Lots of black bears, and grizzlies as well. 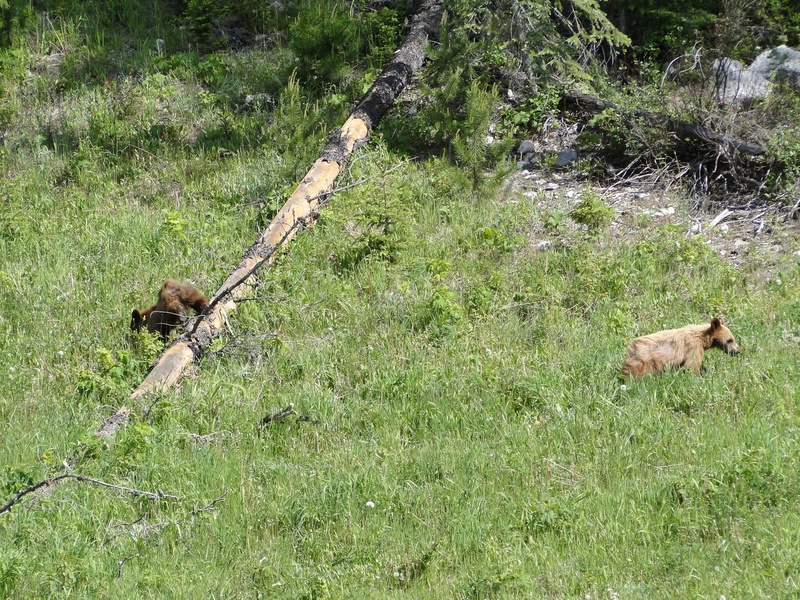 We saw two baby grizzly cubs playing on the side of the road. filled up with diesel in Prince George today and the diesel was $5.40 per gallon. GULP! will post photos when I can. 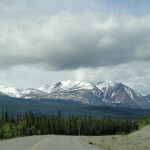 We will drive to Dawson Creek tomorrow, and Monday morning we start the Alaska Highway. Well as you can see, I figured out how to download the photos from this week. Will someone let me know if you can click on the photo to enlarge? And is it straight? Thanks! 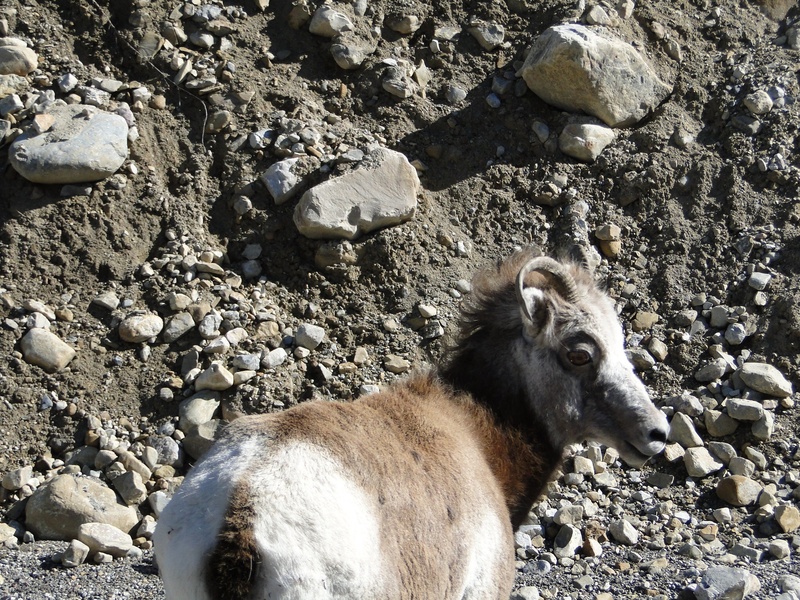 We didn’t sleep well last night due to traffic noise near our campground. Plus we were antsy because we were crossing the border today. We had an easy time at the border. 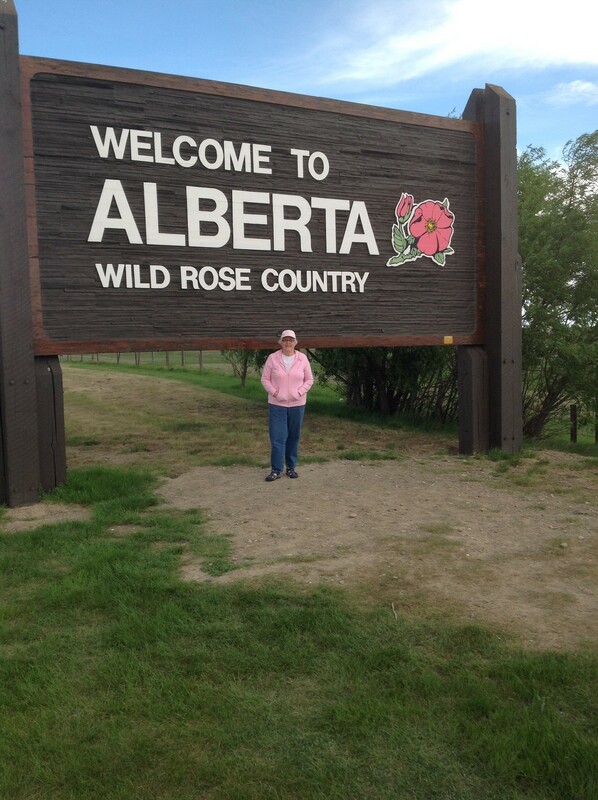 The agent asked where are we from, where are we going, how long will we be in Canada, any firearms, any alcohol, any cash over $10,000 (couldn’t help but chuckle). Welcome to Canada! 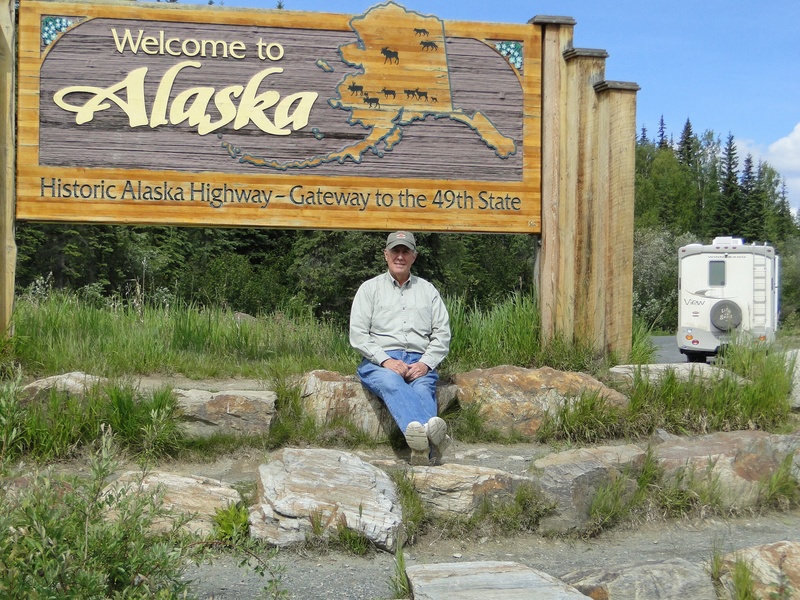 we are meeting people at every stop who are headed to Alaska. 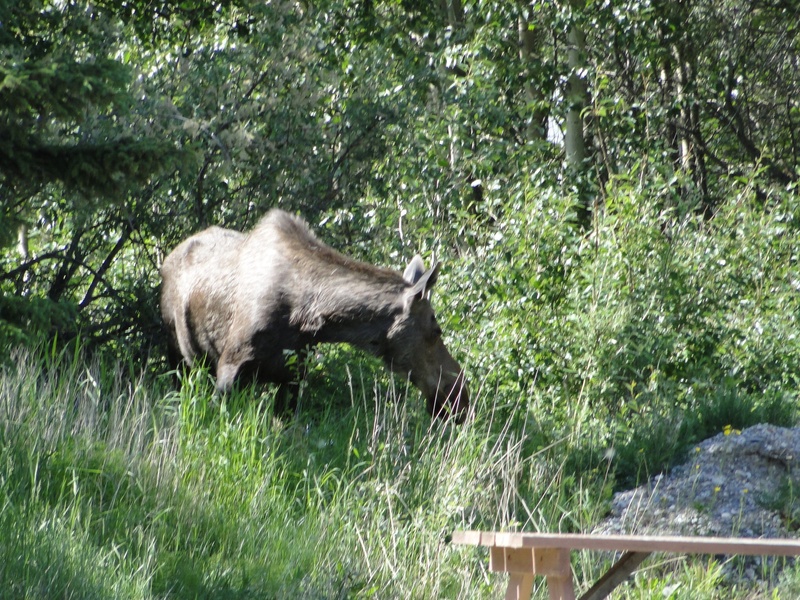 We stop at the visitor center, and the same couple pulls in. 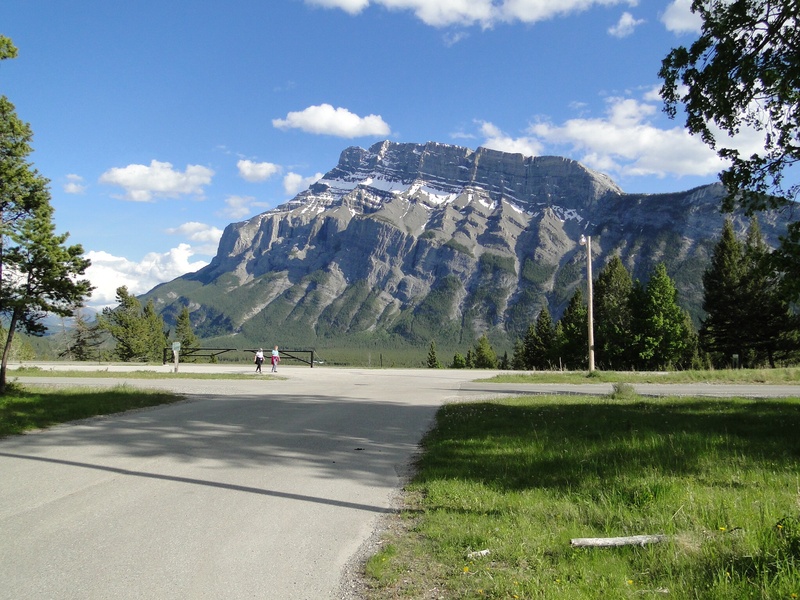 We are all going to Banff this week. It’s a lot of fun meeting all these folks from everywhere in the USA. Stopped at a little bank and did a currency exchange. Today the rate was $1.055 per US dollar so we got $527.50 for $500. This exchange reminds me of reading Mothers journal when they first went to Alaska. I can’t remember the exchange rate, but she was positively giddy over the possibility of getting more Canadian money for the US dollar! 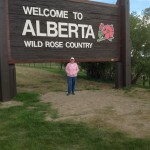 We are spending the night in Fort MacLeod, Alberta, Canada this evening. We enjoy watching all the rigs come in. Lots of big boys, over 40 feet long! 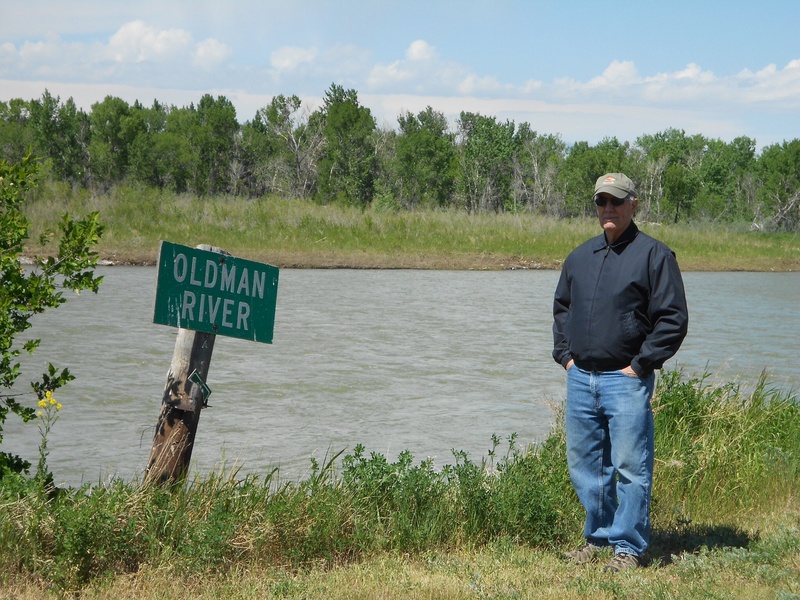 We are in the Daisy May Campground right on the Oldman River. Really nice location. 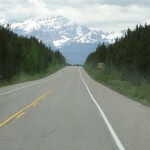 Tomorrow we will head for Banff National Park. Actually we are meandering because we made a wrong turn and added 70 miles to our trip today. We blinked and missed a turn, and decided to just go on and in a round about way get back on track. Unfortunately, the track had lots of graded roads, all gravel, for miles and miles. 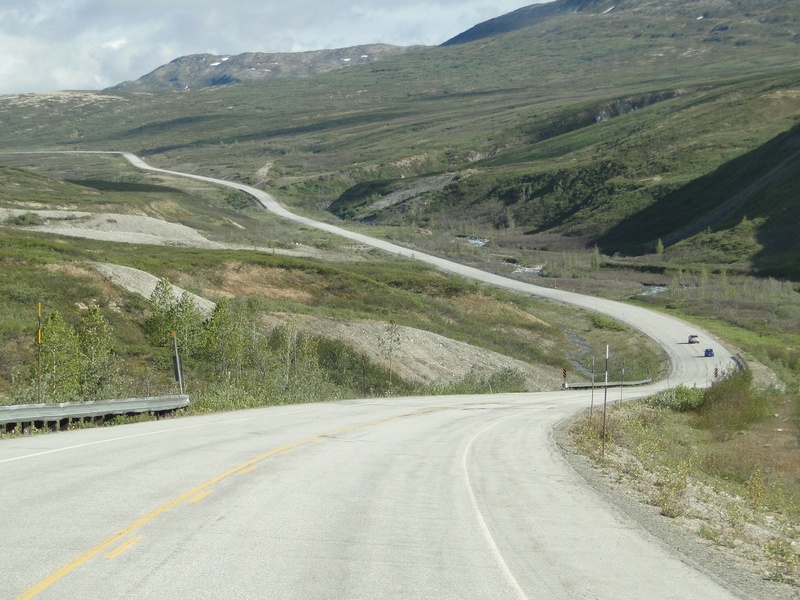 Actually we haven’t been on any worse roads in Alaska. But we got to Great Falls around 2:30 pm so all is well. 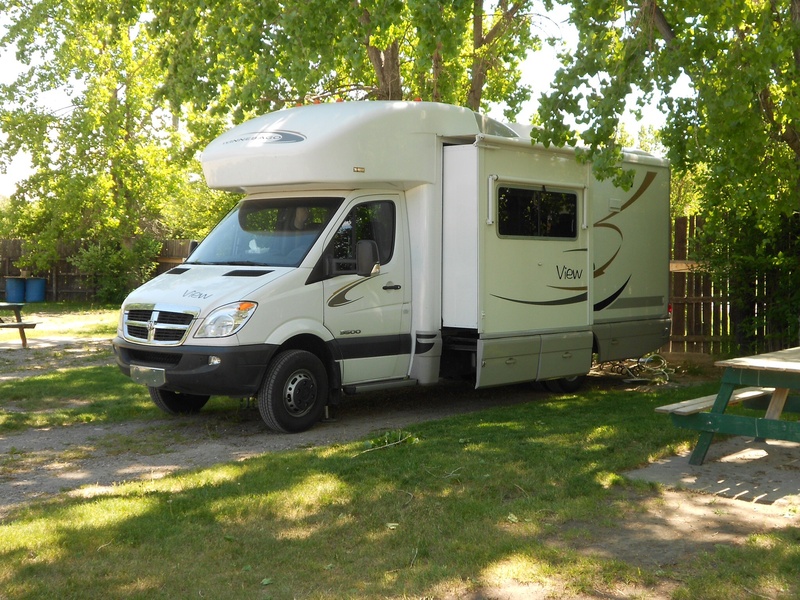 We are at Dicks RV Park, which is really the jump off campground for those traveling into Canada. It’s a zoo here today. 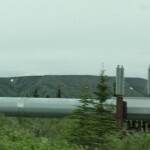 There is a 25 rig caravan traveling to Alaska. 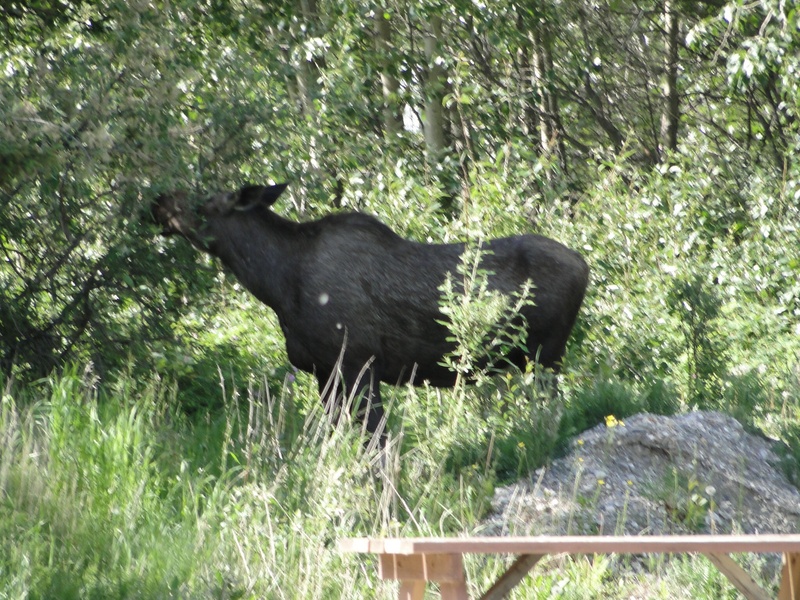 Plus the campground is full of folks like us. 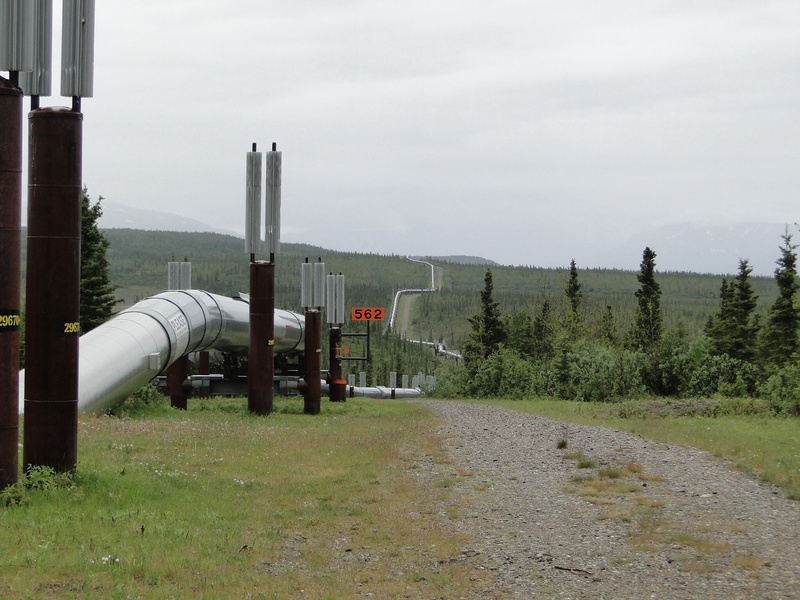 No telling how many are going to Alaska. Just so happens the couple who checked in after us parked next to us, and they are going to Alaska for the first time. They are from Louisiana. So I put on my schoolteacher hat and got to work explaining things to them. They didn’t do much research so they are winging it. 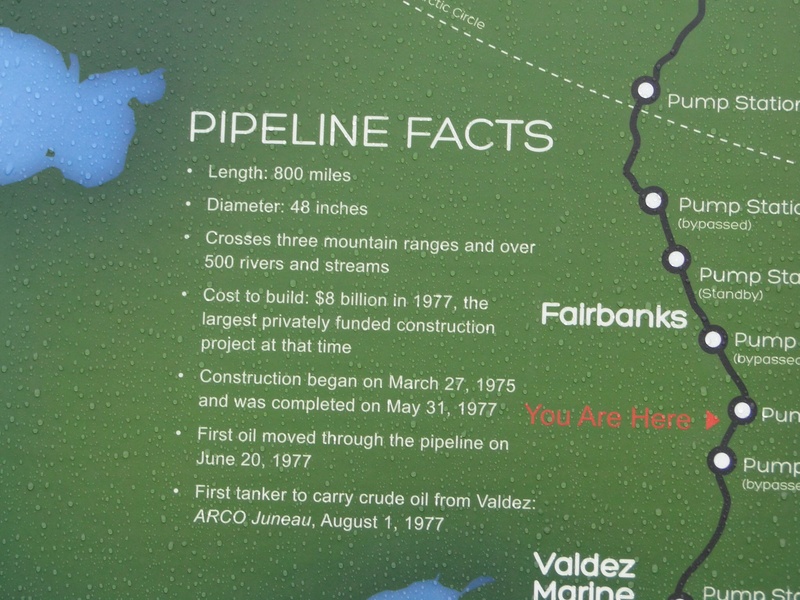 We all stay in Great Falls because we are 100 miles from the Canadian border. It’s not a good idea to wait late in the day to cross so we should get to the border before noon. 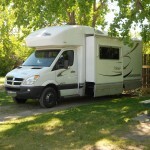 We will drive another 100 miles or so to the Daisy May campground in Fort MacLeod, Alberta, Canada. 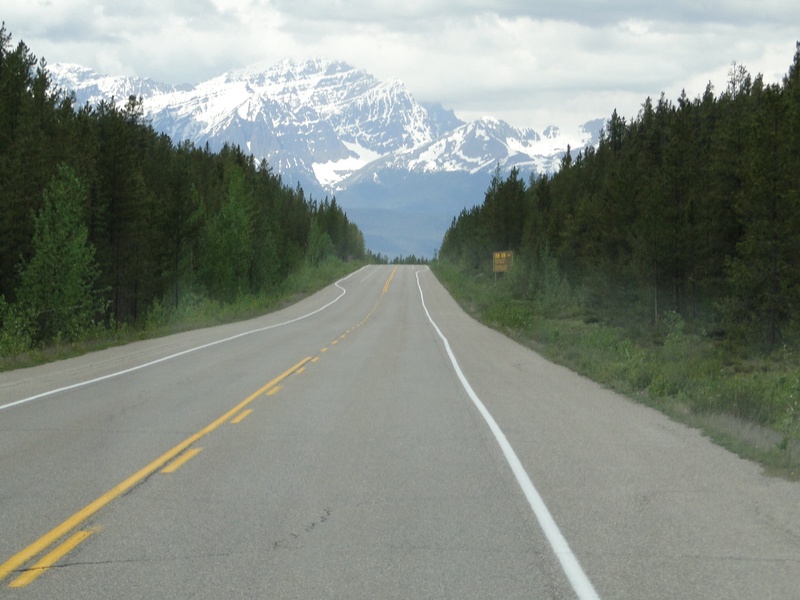 We’ll also have to stop somewhere and get our Canadian currency before we get farther up the road. 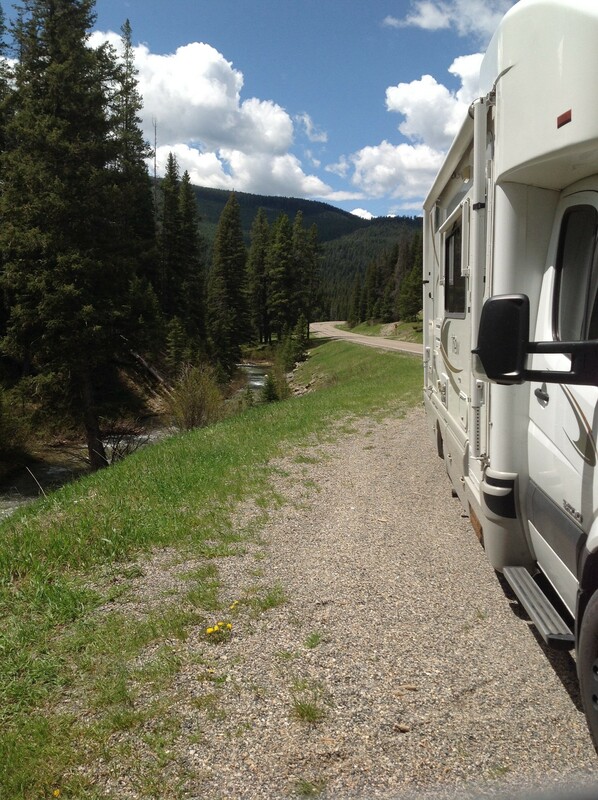 The only photo today is at our lunch spot of the day, somewhere lost in Montana.